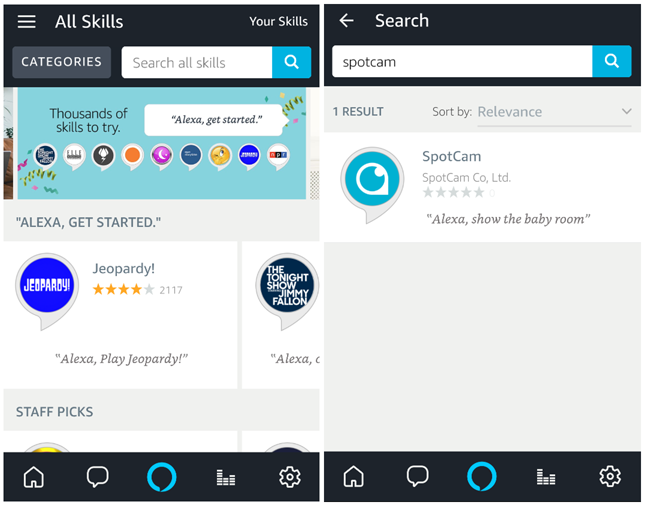 SpotCam has integrated with Amazon Alexa service and registered a skill for user to display their camera video on Amazon Echo Show or Echo Spot by saying a simple phrase. 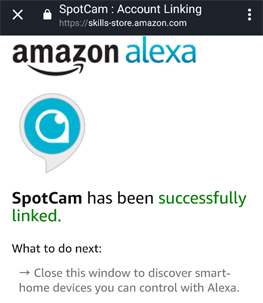 This article will guide you to connect your SpotCam account with Amazon Alexa service and control your camera via Alexa directly. 1. Make sure you already have an Amazon account. 2. Make sure you have Amazon Echo Show or Echo Spot, and it already setup with your Amazon account. 3. Make sure you already installed Amazon Alexa app on your mobile phone. 4. Make sure you already have a SpotCam account and there is a camera installed with the account. If you have all above, then we are ready to go. 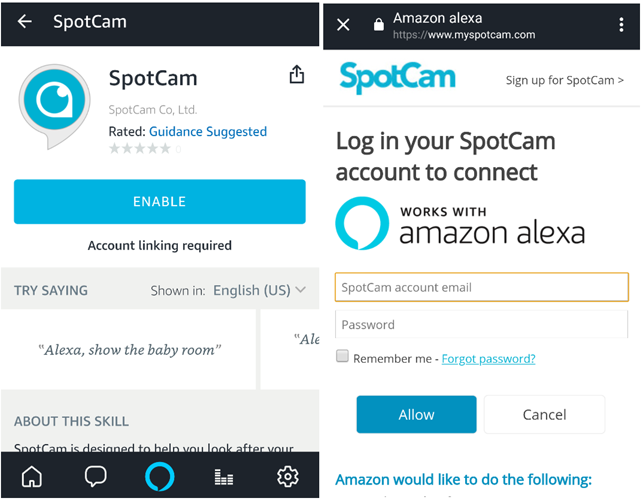 Please follow below steps to connect your SpotCam account to your Amazon account. 1. Login Amazon Alexa app be using your Amazon account. 2. Open the menu and press Skills to open the skill page. 3. Search SpotCam in skill page and you will find our skill. 4. 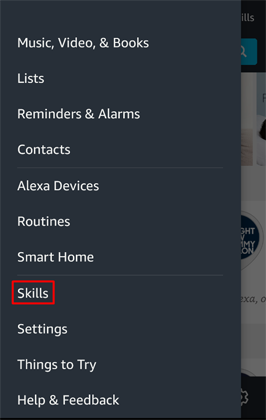 Click on the skill and enter to the skill page. 5. Click Enable button and you will be direct to the account connection page. 6. Enter your SpotCam account Email and password to connect your SpotCam account to your Amazon account. 7. 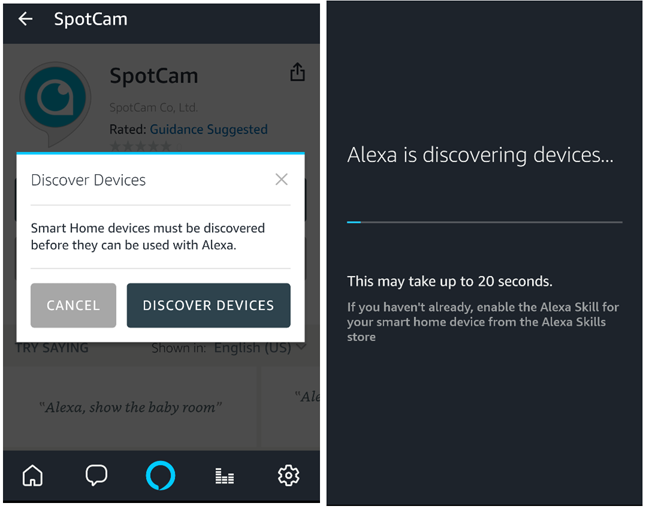 Go back to Amazon app and you will find a message asking you to discover those devices which has been installed with your SpotCam account. Wait about 30 seconds for Amazon app to search all devices that you can control. 8. After searching process is completed, you will be able to say a simple phrase to display your SpotCam video on Amazon Echo Show or Echo Spot.  Alexa, show me "camera name"
 Alexa, show the feed from the "camera name"
If you want to stop the video display, you can say below phrase.